This is not an undertaking for the impatient. Smoking a brisket is certainly not difficult if you can multitask... and stay up late to get it started... and get up again in the wee hours of the morning to keep the fire going... and wait about fourteen hours to get your first taste of this thing. Don't be scared. You can do it. Note: All ingredients are estimates as you will never find a brisket that is the same size twice. Also I don't actually measure anything. 1 giant pile of wood — ½ apple wood and ½ oak or hickory (or a combination). You can use any of these woods or any combination of these woods, but I have found apple wood provides the best flavor while splitting it with a harder wood slows the burn and makes it easier to control the temperature. You can also do this with charcoal and wood chips or a pellet grill. I'm old school. I use a Char-Griller smoker. Mix the salt, pepper and garlic in small container (I use a lid and just shake it). Defrost your brisket if necessary. This will take most of the night or day in a refrigerator. Sharpen your knife. No, it's not fine. Sharpen your knife. Cutting fat is dangerous if you can't slice through it easily. Place your brisket on a cutting board with the fat cap up. That's the big giant slab of fat on the brisket for those of you who've never dealt with a piece of meat this big. Trim off the excess fat, leaving about a quarter of an inch thick layer. Score the fat cap into two-inch squares and rub the entire brisket with a light coating of olive oil. 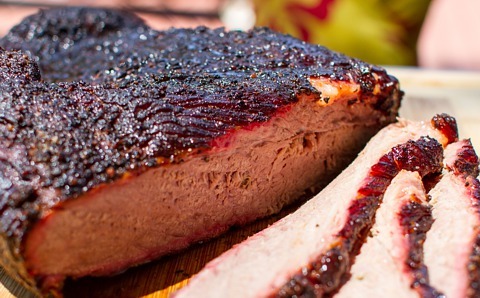 Cover both sides of the brisket with a solid coating of the rub and work it into the scoring. You may need to make more rub. This will depend on how much you like salt. You can now wrap plastic around the meat and place in a refrigerator allowing the rub to soak in, or move straight to cooking. I don't wait. I like to sleep periodically through this. If you're using a grill, set up your grill for indirect cooking by building your charcoal or wood stack off to one side. If you have a gas grill use a smoking tube or put your wood chips in a small metal or foil container. Light the fuel and wait for it to be ready to cook. Add your wood chips (soaked) to the coals or a pan of water per your personal preferences. If you don't know how to do any of this you have much more reading to do before moving on. I recommend the little "Search" field at the top of this site. If you're using a smoker, build your fire in the fire box using half apple and half hardwood. With a fire box you don't need any special tricks here. You'll get plenty of smoke from the fire. Once the fire is burning evenly without assistance you are ready to start smoking. Either set-up should be at about 225°F. If you're using a grill, place the brisket fat side up on the rack with a drip pan below next to the coals. Cover with the lid and bring the temperature back up to 225°F. If your grill doesn't have a temperature gauge, use a meat thermometer. If you're using a smoker, place the brisket fat side up on the rack with a drip pan below or on the rack above your roasting pan. Close your lid. This is happening. Monitor the temperature of your grill or smoker. Check it every hour or so, staying as close to 225°F as possible. Do not open the lid unless you need to add more charcoal or wood chips to maintain temperature or the smoke. This isn't an issue if you've got a smoker. Just add wood as necessary to the fire box. When the internal temperature of the brisket reaches about 150°F, surface evaporation will cause the internal temperature to plateau. This is called "the stall." It happens in the last two hours or so of cooking. We'll solve this with the "Texas Crutch." Drain all but about 1/2 cup of the brisket drippings and place the meat into the pan (you'll need to remove the roasting rack). Add the cider vinegar and apple juice into the pan. Add water if necessary to bring the water level to about halfway up the pan. Cover the brisket and tightly wrap two sheets of heavy aluminum foil over the top edges of the pan. Bring the grill or smoker temperature back up to 225°F. Continue cooking for two hours. 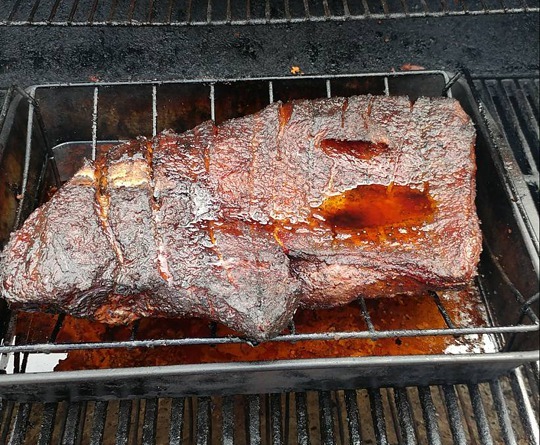 When the internal temperature of the brisket is 195°F, pull the pan from the grill or smoker. Cut the brisket in the pan when you're brave enough to risk it. This pan is hot. You can also remove the meat from the pan and cut it on a butcher block, but I prefer to keep the brisket in the liquid. Share with friends and brag for weeks. Smoking image ©2010-2017 Rum Runners. All rights reserved.